This story started in December and as usual Kansas had turned cold. I stayed here last winter and decided not to do that again. Two years ago I talked to a young lady named Jailyn and that turned out great. Her grandmother put me in contact Jailyn's great uncle who lived in Conroe, Texas. It was a lot warmer in Texas than it was in Kansas. I went there and met Jailyn’s great aunt and uncle, a bunch of farm animals and more birds than I ever knew existed. As I was sitting there feeling sorry for myself I heard a small voice asking me if I was all right. I looked and saw a pretty girl who I knew to be named Sammy. "I'm ok," I said. "Just feeling sorry for myself. It's getting cold and I have some friends in Texas. Texas is so big and far away that there is no chance of getting there without knowing exactly where I am going and who I can stay with." "I have a great uncle in Conroe, Texas." she said. Well I guess you know that was strange because, as I said, Conroe is where I went two years ago. What are the odds. "I'll get my Grandma to get you all the information to find him in Conroe." she said. After school was dismissed I waited outside the building like Sammy had said. It was cold outside so I was pretty relieved when I saw her coming up in a car with a beautiful grey haired lady. That lady sure looked mighty familiar. 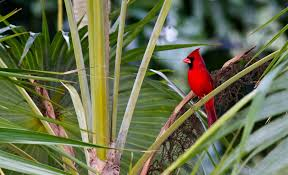 "Hello silly Cardinal." said the lady and you wouldn't believe this. It was the same grandma Jailyn had. What are the odds? Well anyway, this woman (who I will just call Carol) took me to her home and gave me a cup of tea to warm up. She also got me up to date on the folks in Texas. She said that If I was lucky I might be able to get a ride instead of flying all that way. I left Sammy’s Grandma with a number in my cell phone for my contacts in Texas, a web page for a trucking company that was named after me, a tummy full of tea and a new appreciation of how humans can share grandmas and old uncles. Carol recommended that since I was leaving later than most of the other birds I should use the web site she gave me and try to hitch a ride with the trucking company. That also meant I wouldn’t have to memorize that migratory map again. I did save it to my iPhone just in case and here it is for you too see. If I hitched a ride I might just go all the way to the Rio Grande Valley instead of staying in Conroe. I had heard other birds talking about it but I didn't know anybody there. For humans that means the border with Mexico but for cold birds like me it’s a huge and warm place. Lots of humans like birds a lot and put out bird food in feeders in their yards. I used my iphone to get in contact with the trucking company. They told me that their top driver was eating supper in Topeka as we spoke. The dispatcher said that if I would fly on over to the interstate exit for Mid Continental Airport that the driver would meet me there. They cautioned me that this driver used to drive a tour bus so he would likely talk my ear off. Since he was on his way to the Rio Grande Valley with a load of birdseed it was a real stroke of luck for me and I decided I didn’t care how much he talked. I packed my beach clothes and sun glasses and headed out right away. My poor little wings were about to fall off when I first saw the large metal birds. They make so much noise when they land and take off it can make your head spin. ​ Sure enough the driver was pulled over in his Cardinal truck waiting for me. The driver introduced himself as Gabby which he said was short for Gabriel. I quickly decided that is meant something else. I know you must be wondering how a Cardinal is so lucky as to have a truck full of birdseed waiting for him. Just gotta know folks I guess. I decided right then that I would keep a diary and give it to Sammy when I got back. ​ It turns out that since I have no thumbs it’s very difficult to write so I emailed this to Sammy’s Great Uncle Lee. He typed this all out for me and put them on this website. I was very grateful for the ride but boy did that driver like to talk. As we got on it for the trip south he told me all about the Kansas Turnpike and how it was built from 1954-1956. Gabby said that was before there were even interstate highways. He said the turnpike ran from Kansas City, through Lawrence and Wichita to a land called Baja Kansas in the south. I had never heard that strange name and he admitted that it was once really called the Indian Territories. 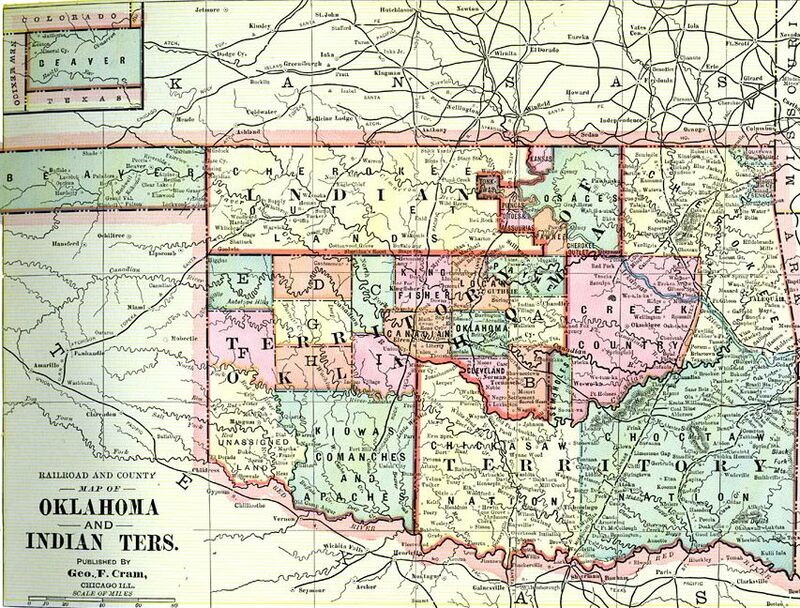 He said it was now called Oklahoma and that he had been making something humans called a joke. I did not understand. Gabby said that the United States had moved many Native American tribes of Indians here from places like Florida, Georgia, Arizona and other places. They wanted to put them all in one place and they just happened to have one that nobody else wanted. It was called the Indian Territories or Indian Nation and there are still Native American groups there that have their own governments. He said that things changed when the country began to realize that the land was worth something. He seemed to get sad and quit talking for a while after that. After that stuff with the Baja Kansas name I had some doubts so I dug into my iphone and found this history for kids (and cardinals). 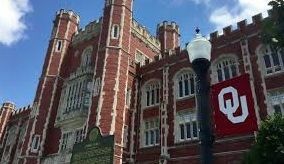 He said that the University of Oklahoma (OU) and the University of Texas (UT) play something called the Red River Shootout in a place called the Cotton Bowl. None of that made much sense to me. I thought he was making another joke. Who would make a bowl of cotton and why would a bunch of students shoot each other? Once again I went to my iphone to figure out what he was talking about. We saw the Cotton Bowl from the freeway. We did not see the Red River shootout because it was the wrong week but we did see the Red River that Oklahoma has to cross to get there. I guess the river does look pretty red just not as red as me. I mean it looks brown too. 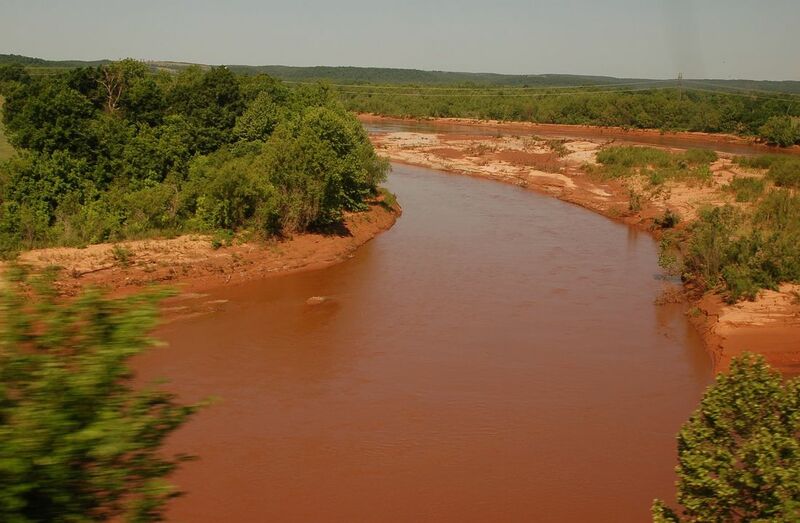 Gabby told me it’s because Oklahoma has a lot of land that is red clay from the iron oxide in the ground. What you see is that dirt in the water. ​He had bottled water in his truck and I’m glad because I would hate to have to drink that muddy stuff. I cannot say there was very much that was interesting before we came to the strange land Gabby called Dallas. It just looked like more Kansas and Oklahoma. I hadn’t seen so many people in such a hurry to get nowhere in a terribly long time. As usual, Gabby had something to say about the history of this place. 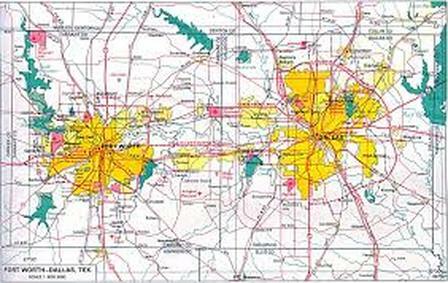 He said that it had grown from a couple cities no bigger than Wichita to the largest inland metroplex in the United States. There is so much to learn about DFW that I am just giving you a link instead of going on, and on, and on. Bigger than Connecticut and Rhode Island combined? Come on! If you happen to be one of those people who prefers your information in a map, here ya go. Interstate 45 goes south from DFW and I was happy when we got on it. ​There are lakes in DFW and it turns out there are lakes over most parts of Texas. Caddo Lake close to Shreveport Louisiana is the only one Gabby knew for sure was not manmade. 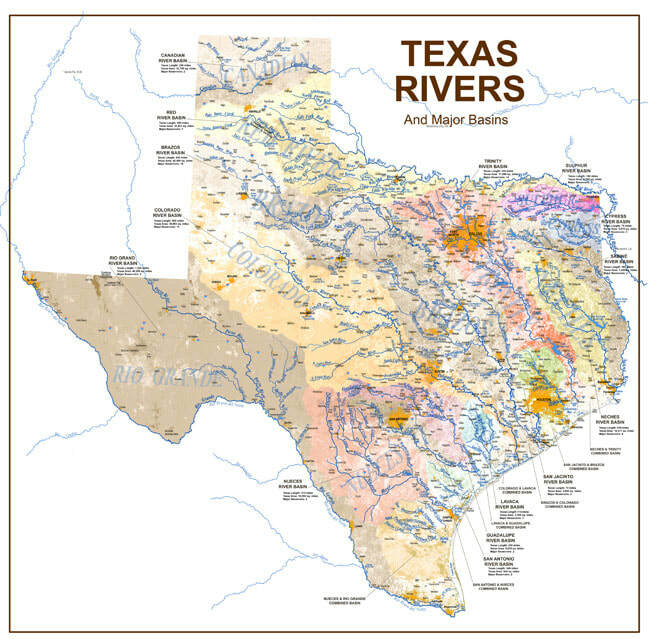 Texas has many lakes that are for flood control and drinking water. Before they made them Texas would have terrible floods, especially during the spring, and not enough drinking water when the rains stopped. The last time I was here Texas was in a drought. Floods now are as likely to be caused by hurricanes as by inland rains. You can see the land change as you head south from Dallas. It slowly becomes flatter as it turns into a coastal plain. 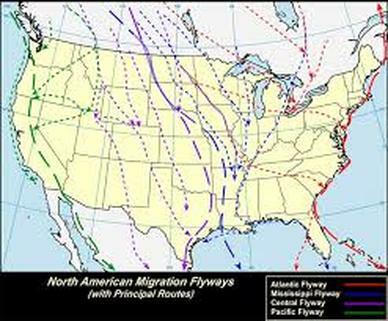 ​Now that we were south of Dallas we were right in two major paths for the bird migrations and I started to see birds that were headed south for the winter. I wanted to give them rides but Gabby said our arrangement was special. Many looked more like me but tired from flying. Gabby told me that they really liked stopping at lakes. It was right about now that we started delivering bird food. Gabby said we would pass Fairfield where I had met Uncle Lee and Aunt Sally two years ago. If you read my post from then you know that it has a big lake with a power plant. I remember seeing a herd of deer when I was there. Texas has a lot of deer but what they really have is hogs. We were not carrying hog food and I was glad. They look much meaner than the tame hogs I was used to. There are wild or feral hogs in every part of the state. The law says you can use anything you choose to hunt them. They ruin crops and are an uncontrolled nuisance according to Gabby. They steal the food of the livestock and sometimes worse. This is what a hayfield looks like when hogs have been rooting around. Wild Hogs are considered an invasive species; The picture on the right is just to show them closeup. The proper name used to be feral hog. Feral means they escaped captivity. Since most of them were born in the wild they are now just called wild hogs by most. I am told that there are people who make a living hunting these critters. Uncle Lee says he has eaten wild hog and doesn't think he will spend any energy hunting them. Statue of Sam Houston. Courtesy of Google Images. The wild hog whose species has never been domesticated is called a javelina. It truly is not a pig but is a peccary. Sam Houston was the Hero of the Battle of San Jacinto, the President of the Republic of Texas, and the first governor of the State of Texas. 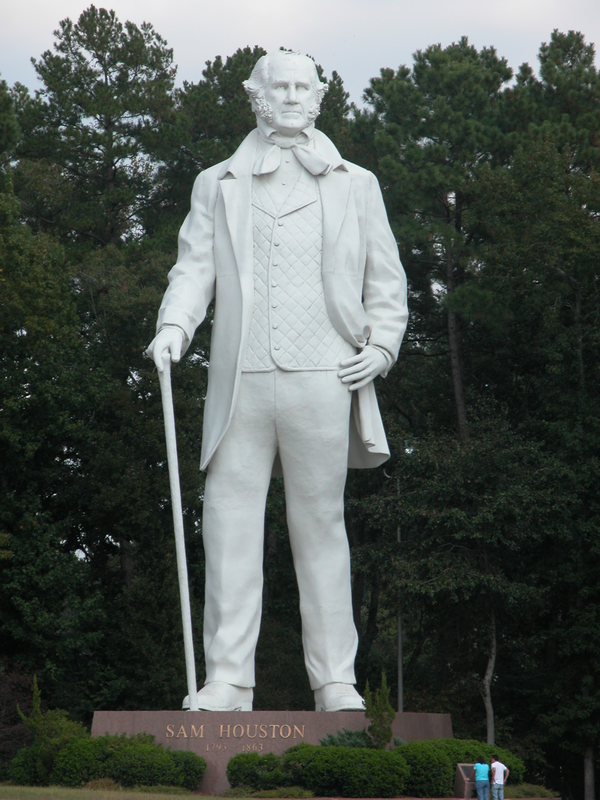 Photographs of Sam Houston served as the model for this super sized statue. The statue is located south of the City of Huntsville which is just North of Houston. ​Uncle Lee says that when you are heading north on I-45 and you see the statue of Sam you generally feel that you have escaped Houston. Traffic is going to get better. I decided to stay with Gabby while he was making his deliveries. He was going south and even Conroe turned out to be colder than I wanted. We made the first delivery to the Petsmart there. That was about 20 minutes south of the big statue. Gabby told me that he intended to drive through Houston, make a delivery and give me a tour of the wildlife sanctuary in Anahuac. Then he intended to go back through Houston and after an overnight stop in Galveston we would go south to the Rio Grande Valley. He told me he thought it would be a good idea for me to hang out wherever I felt comfortable for the winter and that a good choice just might be in the valley. He said he had a friend with a place there and enough bird food to tide me over. Since feeding all the migratory birds meant he would have to make trips all winter long I could just call him and tell him when I was ready to head back to Kansas. I thought that was a good idea. While I was in Conroe I called Sammy’s uncle and told him what was happening. He said that I should stay warm and that he would be waiting for me when I showed up. He was disappointed that he wouldn’t see me right away like he did two years ago but since Conroe was getting cold he wished he could go with me. He said he didn’t eat bird food so he guessed he would just stay home. Seabirds at Anahuac National Preserve by Anahuac, Texas. Courtesy of Google Images. Houston was a lot like Dallas in that everyone was running around like crazy. It was pretty so far as cities go but not my cup of tea. Gabby told me that the Texas gulf coast (really all over the Gulf of Mexico) was a bird watchers paradise. I asked him to explain bird watcher to me and he said that many people watched birds through binoculars, took their pictures, and kept track of what they had seen in little books. That caused me to look around and make sure nobody was watching me. Gabby said I should be happy that there were bird watchers. They were the ones, he said that put out all the bird food in feeders. Birds come and eat. 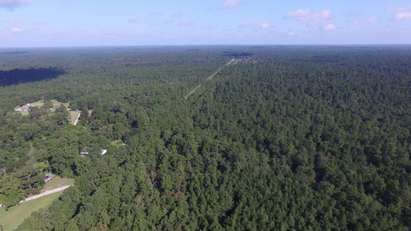 Homeowners and birdwatchers enjoy watching birds. He explained that a group called the Audobon Society was all bird watchers and fanciers and a big voice for wild birds. When we arrived at the bird sanctuary in Anahuac Gabby said that I should stay in the truck while he made his delivery. No problem, I didn’t want to talk to all those strange water birds. He said that wasn’t what he was talking about. You will notice there are no birds in the picture of the alligator. They always take off flying when they see him. Sometimes one bird will get spooked and thousands will take off. The alligator is why he wanted me to stay in the truck. When we were done on Anahuac we headed back to Houston. Gabby told me that there was a Ferry that would take us to Galveston but he didn’t feel comfortable in taking it with this big truck. Besides he had things to show me in Houston. He asked me if I knew what was the busiest port (counted by tons of cargo) in the United States. I told him that I had no clue. Perhaps Galveston. 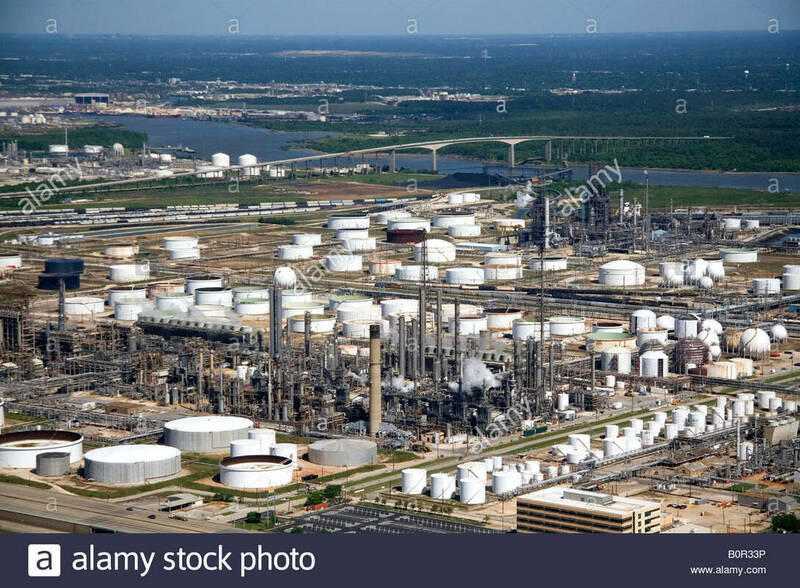 Gabby said that in 1900 that would have been a good guess but today (by tonnage), according to Google, it was Houston or by some accounts Los Angeles. How can that be I asked. It’s not even on the Ocean. No, he replied, but there is a ship channel and we are going to drive right over it. This is one reason it’s so busy. These refineries take on crude oil from vast pipelines and big tanker ships. They send gas, diesel, and other chemicals and fuels out to the world the same ways. Sometimes, at night he said, the refineries light up the sky just like it is daytime. I remembered seeing one near Conroe two years ago and I believed him. Oil and gas are kings in Houston. This is another thing that makes Houston’s port so busy. Containers come in on big container ships. Big cranes like this pull these container vans off the ship, put it on a trailer……. Bridge to Galveston Island. Courtesy Google Images. 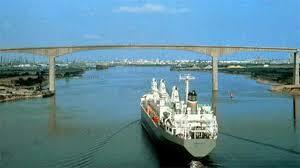 Until 1900 Galveston was way ahead of Houston with respect to trade. Then a huge hurricane came and killed many people. The city on the island was basically destroyed and had to be rebuilt. This was long before we started naming hurricanes. It was just called Isaac’s storm after the weatherman that predicted it. 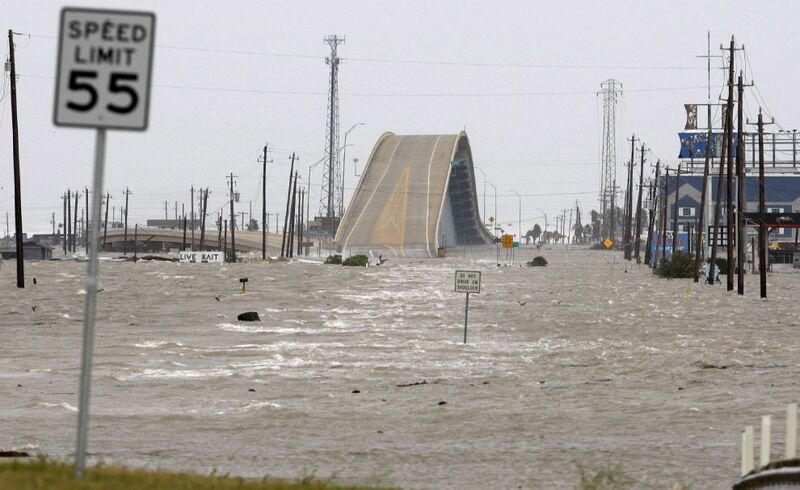 Galveston bridge during hurricane Ike. Courtesy of Google Images. Then Hurricane Ike happened. The city evacuated and very few people were hurt because the weather people were able to warn them. Evacuating through a major city like Houston is tough. Harvey is the name of a hurricane from last year that caused a lot of problems as well. Gridlock as Houston and Galveston head north on I45. Courtesy of Google Images. This is what an evacuation looks like if you don’t get a head start. I told Gabby that I couldn’t fly in a hurricane and I certainly couldn’t swim. Could we please just get out of here. Johnson space center. Courtesy of google images. On the freeway between Houston and Galveston sits the mission control for the National Aeronautics and Space Administration (NASA). Rather than talk about it here, I will just recommend that you google NASA Houston, Mercury flights, Apollo Flights, and Space Shuttle. Personally I think that humans were not meant to fly. That's for Cardinals. 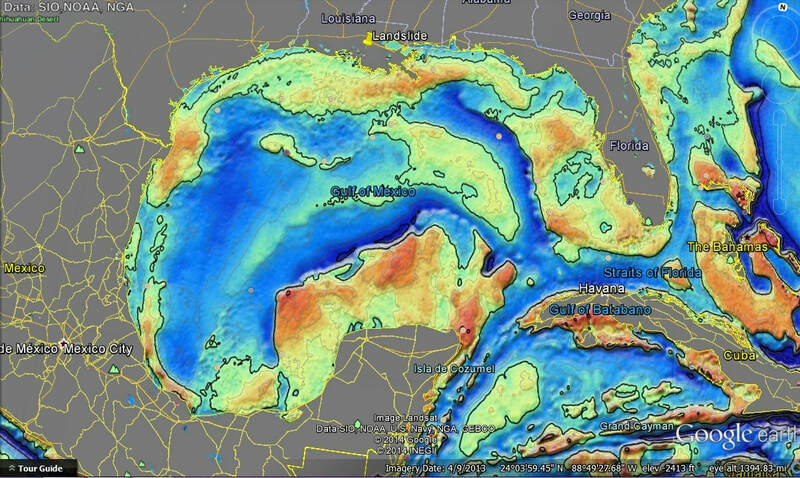 Depth map Gulf of Mexico. Courtesy of Google Images. Gabby told me that it isn’t just Texas that birds migrate to. They also go to Mexico and some to South America. Until he showed me this map I had no idea how close we were. I believe I could fly over it to the Yucatan but the Rio Grande Valley will work just fine. After all I’m a land bird and that is over quite a bit of water. He told me some sort of tale about something called a dinosaur that existed until about 65 million years ago. I asked him just how old he was and he told me he could read. Supposedly an asteroid fell and hit right where it is marked in this picture. He said that the type ground here made the problem even worse but that it was good for humans. He said if we still had dinosaurs we probably couldn’t have humans. All that made no sense to a simple Cardinal like me. This made sense. This is a big product where I was going and that is so because it is warm. 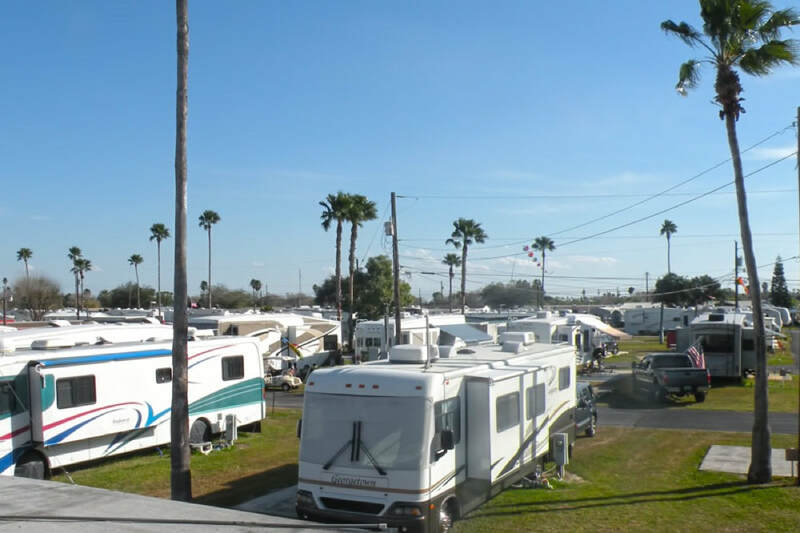 Gabby said he was taking me to a snowbird RV camp. He said that every year retired people come from the very cold northern states (like Kansas). They get in their recreational vehicles and drive south before it gets really cold. When it warms up again they head back north. A gulf coast summer is as bad as a northern winter according to some. This is a picture of the winter home of Gabby’s friend’s winter home. There were several that looked the same to me but he said he didn’t know any of the humans in them. Gabby left enough bird food to keep me until spring. Gabby told me to call him when I was ready to go home. This palm tree is in my new back yard and It’s a lot warmer than Conroe or Cheney. I think I’ll stick around for a while. 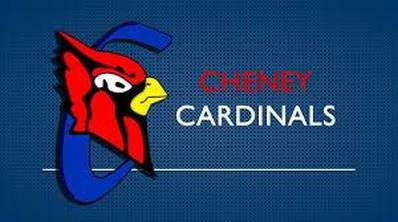 I’m remembering you Cheney. Stay warm.